Fireplaces are a great addition to just about any home – they provide a great source of heat while also being timeless in their beauty. Unless you’re using a ventless fireplace, every fireplace has some sort of chimney. While you might not think about it, there are many dangers associated with chimneys. Everyone has heard the horror stories of people getting stuck in one and not being able to get out – these aren’t just myths to frighten people either. Whether it was through robbing a house, exploring, or just trying to clean it, thousands of people have found themselves stuck in a chimney. Most of the dangers associated with chimneys can be a result of improper maintenance. For instance, a failure of the damper can cause smoke to reroute through the house. This smoke can cause carbon monoxide poisoning leading to sickness and possible death. Not cleaning a chimney can lead to a build up of soot and creosote, which can cause a chimney fire. As 21,000 chimney fires happen annually in the United States alone. These fires can happen in masonry, metal, and wood stoves alike. Usually these fires go for a long period of time, slowly eating away at the structure of your smokestack, but can potentially explode dramatically and destroying your chimney. It’s recommended to have your chimney checked annually, even if you don’t use it often. While doing it yourself might seem like a viable option, there are a host of reasons why you should have a professional chimney sweep take care it instead. 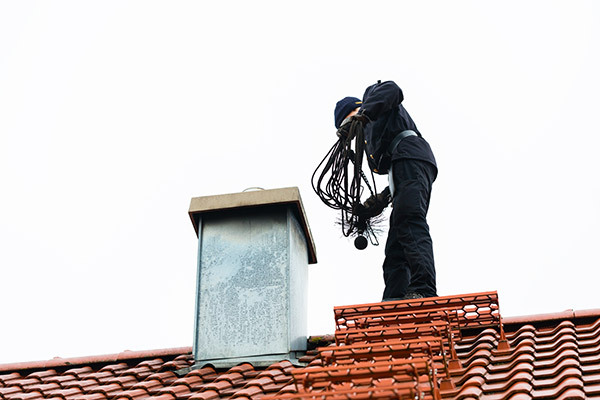 Since it’s clogged up with all sorts of soot and often cleaned from the roof, there’s a great deal of personal risk involved in cleaning a chimney. When cleaning one yourself, you run the risk of falling off the roof. Even if you’re a person who’s comfortable with being on top of a roof, cleaning a chimney is an all around messy business. When cleaning, built up creosote and soot can fall into your home and cause a cloud that covers your floor and furniture. In addition, you won’t know the specific techniques that a professional will have – missing even one spot can lead to an unchecked chimney fire, or a crack in the masonry. Cleaning isn’t the only thing a professional sweep does. They’re trained to spot any structural problems and perform a close analysis of the chimney itself. 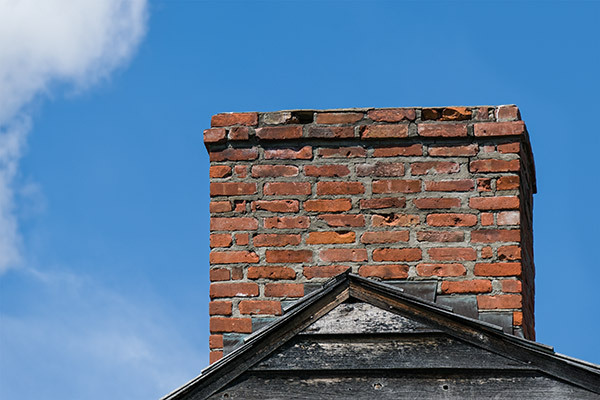 What to look for isn’t always necessarily obvious either – something as small as a hairline fracture in a single brick can open up a world of trouble for your chimney. Cracks in masonry and damages to the flue are the most common problems. You can also have infestations of rodents, bats, or birds. Most chimney sweep professionals are able to fix minor problems on site, giving you peace of mind for any future wood burning activities. There is little room for error in cleaning and inspecting a chimney. Only someone with the proper education and a trained eye can spot everything that needs to be done. While nothing can necessarily replace an annual inspection by a trained person, there are a few thing you can look out for on your chimney. Oftentimes, one of the first things to erode on chimneys is the mortar joints. When they aren’t doing their job it can lead to a build up of moisture that can bring additional damage to the rest of the chimney and the surrounding structure. If you don’t patch these up as soon as possible, moisture can also enter the bricks or other material, causing a thing called spalling to occur. Spalling is when water enters the stone and pops the surface out, further undermining the structural integrity of the chimney. Rust around the actual fireplace is another big sign that moisture may be entering your home through a faulty bit of masonry. If you see peeling or damaged wallpaper around the chimney, this is probably a result of an opening that needs to be patched up. When looking inside of a chimney, you might see the results of a damaged flue in the form of shattered bits in the fireplace itself. Fire damage can also be evident in a few ways. For instance, creosote, which coats the inside of the chimney liner itself, will become puffy or honeycombed in shape. If the fire was located near the top end of the chimney, you might see a deformation of the rain cap, damage to any TV antennas, or even the surrounding roofing material itself. If you have any of these problems, it’s best to get a professional chimney sweep to further inspect and fix what you have. A certified chimney sweep will have all the necessary tools for taking care of your chimney. This can include not only creosote brushes, but also vacuums, chemical cleaners, and cameras. A professional cleaning technician won’t only be dressed properly, but also show their certification. Certification happens through the non-profit Chimney Safety Institute of America (CSIA) or the National Fireplace Institute (NFI). When unsure always err on the side of caution – getting a person who doesn’t know what they’re doing can not only waste your time and money, but cause many problems down the road. When you do set an appointment with a professional sweep, it’s best to not have a fire for at least 24 hours prior. Ashes and soot can stay warm for a couple days even after the fire has gone out. Expect the company to send a pair out, as this makes for an easier and safer job. They should thoroughly cover before and clean the area after, with the best having the area exactly as it was before they arrived. A proper cleaning will not only greatly increase the life of your chimney, but can be a potentially life saving activity. There are thousands of chimney fires nationwide every year that could’ve been avoided if they had just been cleaned correctly. While cleaning it yourself might seem like a good money saving solution, it can lead to a lot of complications and can be life threatening if you make a mistake. A certified professional will be able to focus on a thorough clean while also looking to see any underlying problems. If, between annual upkeep, you spot any problems with your chimney you should schedule an appointment for an inspection as soon as possible. Put that chimney in the right hands, and you’ll have many amazing years of use from it. If your chimney is in need of a cleaning, or you’re unsure entirely, let Early Times come and inspect and/or clean your chimney. We’ve been keeping Chicagoland homes safe and clean for over 30 years – get a free quote now for any of our chimney-related services.